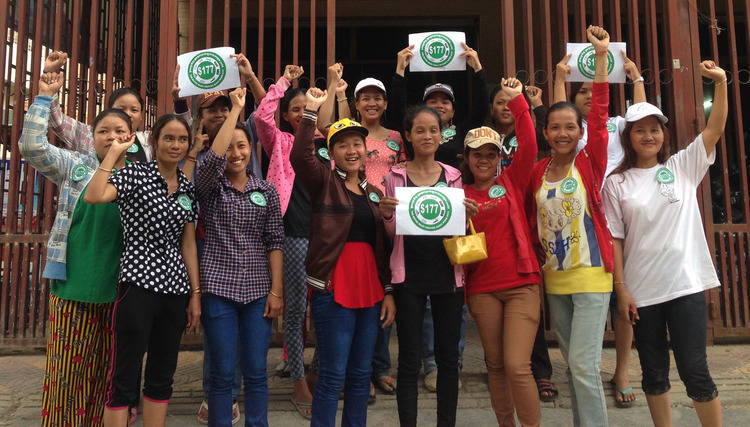 A coalition of Cambodian garment workers’ unions has called on workers and labor rights supporters around the world to demand multinational apparel brands producing in Cambodia raise the wages. Today, Cambodian garment workers sewing products for brands like H&M, The Gap, and Adidas suffer malnourishment and mass faintings -- symptoms of the unlivable minimum wage of $100 USD per month. When workers held protests in the fall of 2013 and early 2014 to demand a wage raise, 5 workers were shot and killed by police and another 25 union activists were thrown in jail on criminal charges that still have not been dropped. Despite the brutal repression, Cambodian workers are about to take action en masse again. On September 17, workers at the supplier factories of H&M, The Gap, Adidas, Levi Strauss, Zara, Puma, Walmart, and C&A will demonstrate their demand for $177 USD per month -- based on a government calculation of the minimum needed to cover basic necessities. Since the repression by the government and employers is largely based on the threat of brands leaving Cambodia for lower wages in Bangladesh and elsewhere, the workers are holding the brands directly responsible. Join us on September 17 by planning an activity at a store, office, or workplace of one of the multinational brands listed above.